Yesterday I got my computer back after almost three working weeks of repairs. I won’t go into the frustration experienced by having to pay €350 to replace the video card on a €2000 iMac barely 18 months old (Grrr!! ), but I did want to talk about the importance of performing regular backups. During the repair period I was able to work almost normally on a slower, oldercomputer (a Mac mini) using a borrowed screen. 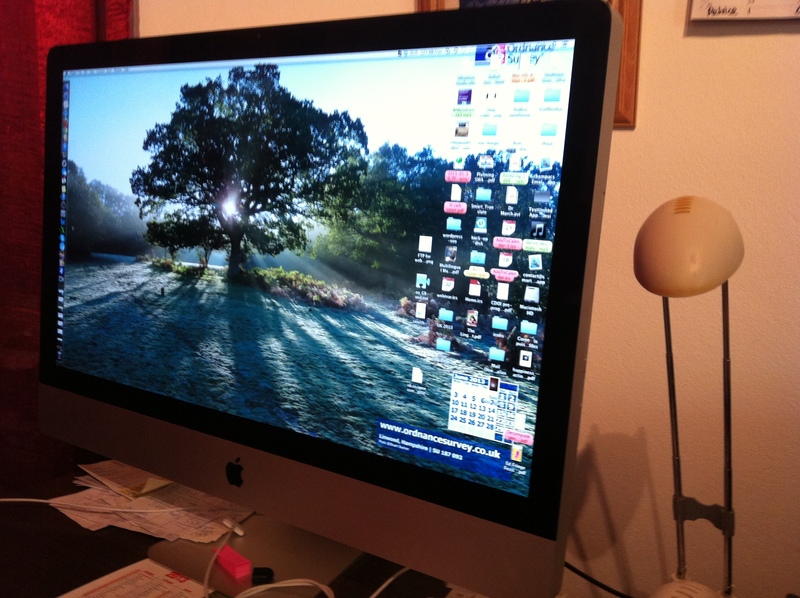 The old 17″ screen I had to use temporarily. None of my clients noticed the difference as I had backup copies of all my files thanks to Time Machine and/or Dropbox. Developed by Apple, Time Machine is a utility which creates incremental backups of files that can be restored at a later date. You can restore the whole system or just specific files; it captures the most recent state of your data, and as snapshots age, they are prioritised progressively lower compared to more recent ones. It’s a system I use because I work on a Mac, but plenty of other systems exist, whatever your computer of choice. Proz.com has carried seven different polls on the subject of backups, most recently in October 2012, when, in answer to the question “The computer you are working on right now fails suddenly. Do you have a backup system in place?” only 54.7% of respondents replied “Yes”. In a February 2012 poll 45.9% replied that they carried out backups on an external hard drive, while 13.2% said they had no backup device. And in July 2011 25.2% said they performed a backup “only when [they] remember[ed]”! Hopefully I’m preaching to the converted, but please don’t forget to back up regularly – you never know when something unexpected can happen. Have you ever lost important files? What backup system do you use, and how often do you use it? Let me know in the comments below. P.S. If you have your own blog(s) don’t forget you can back it(them) up too. It’s very easy – for WordPress go to Dashboard > Tools > Export and for Blogger go to Dashboard > Template > Backup/Restore. (For more details see: Ten minute tip – Back up your WordPress blog and How To Back Up Your Blogger Blog). I have a back-up system, yes, but guess it leaves a little to be desired. I also didn’t know about backing up my blog, so thanks for the prompt to get my act together! I learnt this lesson the hard way many years ago. It was my final year at university and during the summer before the start of the academic year, as well as half way through it, I had gathered all the materials I needed to write my dissertation and had almost finished writing it, when my hard-drive crashed. I lost everything. Two weeks before the deadline. I could not recover a thing and had to start all over again. Lesson learnt. It later proved to be useful in my career, as regular back-up became a rule. That’s an awful thing to have happen Alina, you must have been distraught. As you say, we learn our lessons the hard way. I would surely like to hear why a Mac is better for translator than a PC. Today I can have a good new PC notebook for less than $500, or even cheaper. I don’t necessarily think a Mac is better than a PC for translators, simply I’ve always used Mac computers at home and am used to them. In fact with Mac computers you’re very limited to which CAT tools you can use.